I find that when I put my mind to things, automatic awesomeness ensues. Granted, it takes a little bit of time, but then it all floods in at once. This week I entered the Open Mic UK 2011 singing competition. As a result I’ve been singing around the house with an unplugged microphone trying to work on my ‘swagger jagger’. You have to book an audition, and they emphasise that ‘spaces are filling up fast’ so you’ll get on the ball and apply. They don’t request anything about you save the usual details and the name of your act if you have one. I was thinking maybe they’d want some existing evidence of your past work, but when I think about it most singers don’t have that at their disposal. I wasn’t sure if I’d get the audition, but the morning after I applied I got the confirmation e-mail. My lovely friend, Lucy, is getting married on the day they would have had the Birmingham NEC auditions, so I’ve applied to go to the Cardiff event instead. And my wonderful husband has booked time off so we can have a long weekend in Wales and make it a fabulously romantic city break. Now that’s investing in my music! 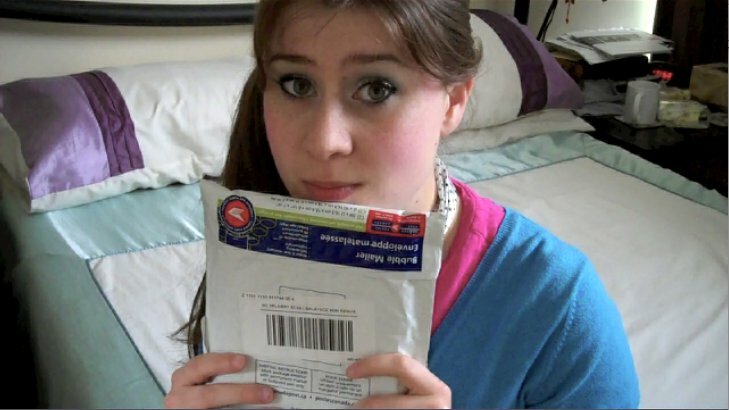 Today’s picture is of me holding a parcel I received from the legendary Sarah LaCroix. She sent me two copies of her CD, Naked and Raw some time around March this year and it finally arrived about two weeks ago. I’ve decided that when I send her something in return I’m going to invest in airmail. I’m just not that patient when it comes to other people receiving my gifts! So, Sarah, I’m sorry I’m slow with replying to your e-mails, but I have written you a letter and I am preparing a spectacular selection of little airmail-able treats! YouTube views are picking up well. I have a Constant Disliker. He or she is very efficient and always manages to get in there within the first hour of me uploading, regardless of the content. Note to you, whoever you are, it doesn’t bother me. If you really wanted me to improve you would send me a comment or message describing what you felt was lacking. Or, if you had a problem with all my content (or indeed me), you are most certainly stupid for returning unabashed every Tuesday and Friday just to tell me you don’t like me. Either way, I win like this. Also, I have ways of singling out who it’s likely to be.